This excellent book shows you how hypnosis can help you in a number of different ways. Habits and Addictions: This would include substance abuse, smoking, and any number of bad habits such as nail biting or hair-pulling. Fears and Anxieties: This includes post-traumatic stress disorder; rational fears such as being raped or beaten up; seemingly irrational fears of things such as the dark, or birds; and those undefined anxieties sometimes called "free-floating anxieties", for which there are no known causes, but which result in great anxiety about the future. Self-Esteem and Depression: These subjects do not feel good about themselves for a variety of reasons; usually because they've had losses, or people have mistreated them, or because they've been "brainwashed" in some way not to like themselves. General Medical Problems: Some medical conditions respond well to hypnosis; such as constriction of the throat, ulcers, insomnia, high blood pressure and pain relief. These are often described as psychosomatic, because both the mind and body are involved, and because stress causes them or makes them worse. Creative Activity: This category includes people who need fresh insight or inspiration. For example, an industry salesman may want to know why he is less successful than he should be, or an artist may want to enter a new realm of creativity. Existential or Spiritual Purposes: Subjects in this category try to understand themselves better to promote spiritual development. Hypnosis is used, just as LSD and other drugs have been used, to enhance religious experiences. Memory Retrieval: If a memory has been registered and stored but forgotten, it may well be retrievable via hypnosis. Enhancement of Performance: Especially athletic, but also the performing arts, public speaking, sales behaviour, and even the aesthetic arts like painting, sculpting or writing. Author, Dr. John R.M. Goyeche, currently practices in Edmonton, Alberta and has 25 years of clinical experience in hospitals, mental health centres and rehabilitation clinics. He has been called as an expert witness at courts in British Columbia, Ontario, Saskatchewan and New Brunswick. He has acted as an Employee Assistance Consultant to several companies and has also taught psychology for four years at university-level. Dr. Goyeche is a Fellow of the International College of Psychosomatic Medicine, a member of the Canadian Society of Clinical Hypnosis and a member of the International Institute for Bio-Energetic Analysis. He is very well qualified to tell you how to Benefit from Hypnosis, Hypnosis by Telephone and Self-Hypnosis and show you how to improve your self-esteem, creativity and performance as well as your spiritual, physical and mental well-being. 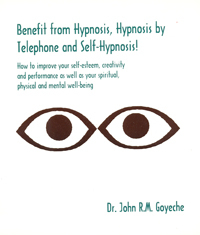 Benefit from Hypnosis Hypnosis by Telephone and Self-Hypnosis: by Dr. John R.M. Goyeche, 212 pages, ISBN 978-1-55270-050-1; softcover, published in 2000; Canadian $21.95.